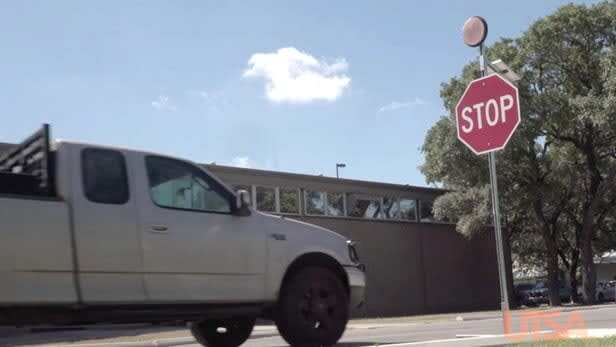 Engineers at the University of Texas at San Antonio (UTSA) are developing a smart stop sign to reduce accidents on rural roads. More than half of all road fatalities occur on rural roads, says the U.S. Department of Transportation. Those roads make up about 70 percent of the country’s byways—but many of them don’t have access to a power supply and are far more likely to not have lighted traffic signals and active traffic signage. This can make them hard to see, increasing the possibility of a crash. The UTSA team, led by engineering professors Sara Ahmed and Samer Dessouky, may have found a solution: a low-cost, self-powered thermal system that detects vehicles and lights up when they are approaching. The stop sign uses multi-pixel passive infrared sensors that detect a vehicle as it approaches an intersection. Once the vehicle is within the sensing range, a signal beacon triggers flashing lights on the stop sign—giving the driver enough time to slow down and stop safely based on how fast they are driving. Rural area vehicle detection using "smart" stop signs. Overall, the smart system has a 90 percent vehicle detection rate and a vehicle classification accuracy of 72 percent. It also uses significantly less power—and is more accurate—than current traffic sensing technologies such as magnetic loop inductors, video image processors, and microwave radar currently found in urban areas. The new technology is also much less expensive to produce: current safety systems can cost as much as $5,000, while UTSA's detection device is expected to cost between $60 to $100 per unit. The project has early support from the transportation sector, having recently been recognized by the American Road and Transportation Builders Association. The team is in the process of patenting their device, and sees uses for it beyond just stop signs—the engineers will work on adapting the technology for pedestrian detection, border security, and vehicle-to-infrastructure communication. Read more about how technology can help improve road safety at Traffic Crash Assessment is Faster and More Accurate with Drones.